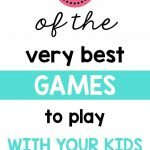 Games are the perfect way to connect with your kids after a long day. Here are some of the best games for kids of all ages. We love to play games in our house. 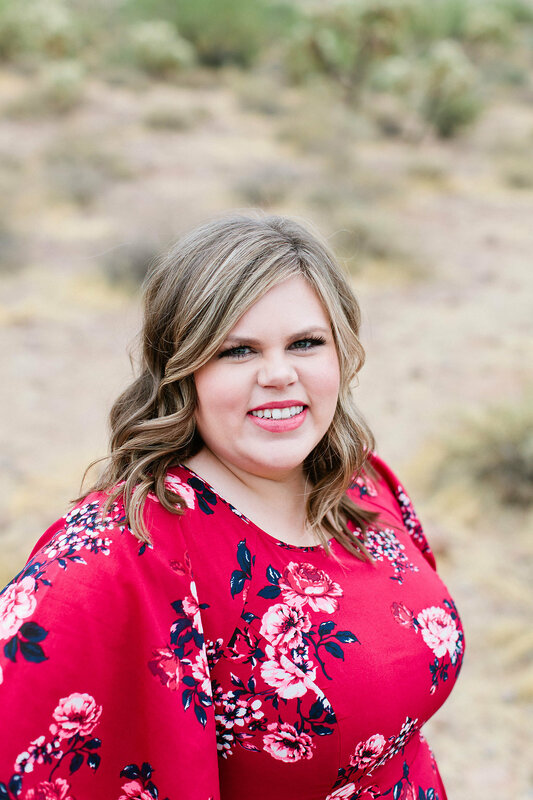 In fact, it’s one of my very favorite ways to connect with my kids–right along with kitchen dance parties, reading, and doing fun book & movie activities with them. I’ve spent way too much money on games that were lame, overly complicated, or overpriced for what you get, but I’ve also found some true gems that we play over and over and over again in our home. Here’s our top 14 games, separated by all ages (around three and up) and older kids (around eight and above). I don’t go by the age listed on the box because I’ve found those never work well for us. I think it depends on the kid! 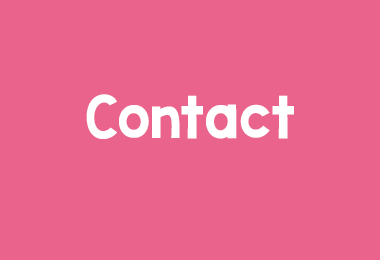 Candyland: This game is simple for all ages, but still loads of fun! I love playing this one with my kids. Even two year olds can get in on this one (with a little help, of course!). Hot Potato: We love this game because anyone can play it and it’s easy to fit in a quick round or two before bed or when you’re short on time. Definitely a family favorite! Also, this game can be played with music and any object, but it sure comes in handy (and gets played way more) when you buy the actual game. Then you don’t have to worry about music, starting and stopping, etc. Connect 4: This is another good option when you’re short on time. Play a round or two with one kid right before bed to get in some one-on-one time after a hard day. Guess Who: This game is one of my very favorites! It’s also a good one for younger kids to play on a team with older kids or adults. And they love it! Headbanz: We’ve been playing this game for years and we still aren’t sick of it! Our game is starting to look a little sad due to overuse, but we still love it! It’s a great option for even the littlest of kids (though they may need a little extra help). 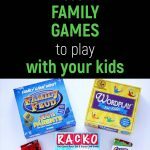 Racko: Our son just started playing this with us less than a year ago, and it’s now one of his favorite games. We have so much fun playing this game together! Uno: One of the most classic games out there, and for good reason! We could play this game over and over and over again! Battleship: My son first played this game with his grandpa and he was so hooked we had to get one for our own house so he could play with us as well. Such a fun game! 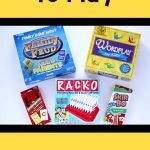 Wordplay for Kids: I was SO happy I found this game! It was super random how I stumbled upon it, but I don’t regret buying it one bit! This is a great game for word lovers and teaching kids. Phase 10: This is my favorite game of all time! I remember playing it with aunts and cousins into the wee hours of night as a young girl. It brings back the sweetest of memories! We have yet to play it with our son, but I think he’s finally ready to learn and I can’t wait to share it with him! Telestrations: I first played this game with my son, nephews, and sister-in-law and we had a blast! It’s seriously such a fun game. And playing it with kids adds an extra challenge. Just trust me…it’s super fun! Skip-Bo: This is another one of my favorite card games. It’s great for kids, but also really fun for adults! Definitely a great game to add to your closet. Family Feud–Kids vs. Parents: I LOVE Family Feud! It’s definitely one of my favorite game shows to watch. And this version is clean and matches up parents vs. kids. 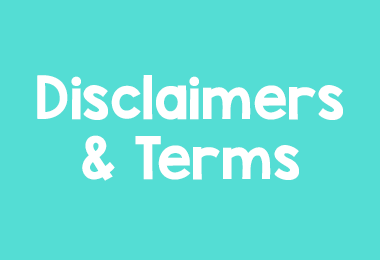 It does a good job balancing it out–asking the kids things kids know and parents things adults know. We had a blast with this one! Scattegories Card Game: This game basically matches up Slap Jack and Scattegories. It’s super fun, fast paced, and can be played for just a few minutes or longer, depending on how much time you have. 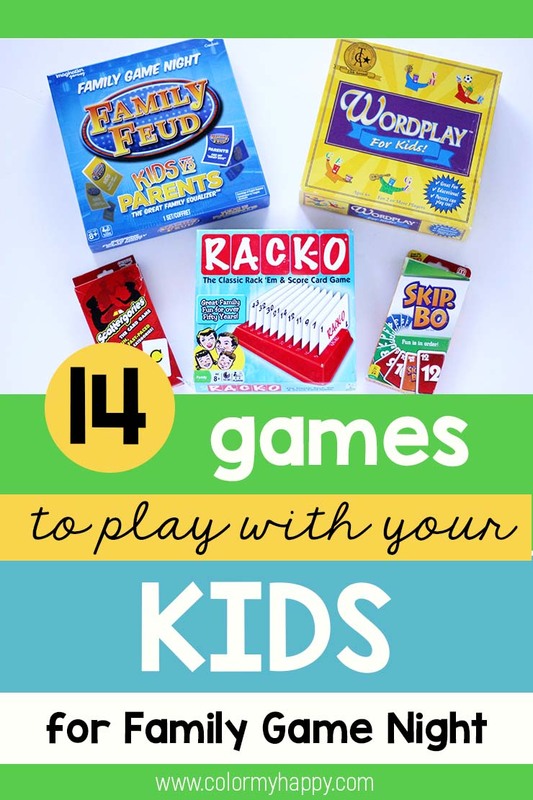 Games are a quick and easy way to connect with your kids or as a family. Pick one night a week and declare it family game night! Then take a few minutes before bed to play a game. Lots of games can be played in fifteen minutes or less! Or play a game every Wednesday when the kids get home from school, for one-on-one kid dates, or anytime you can squeeze them in. We love games at our house and find every game purchase a great investment for our home and family life. What’s your favorite game to play with your kids? If you liked this post, pin it on Pinterest!